Image of a woman’s hand reading braille. 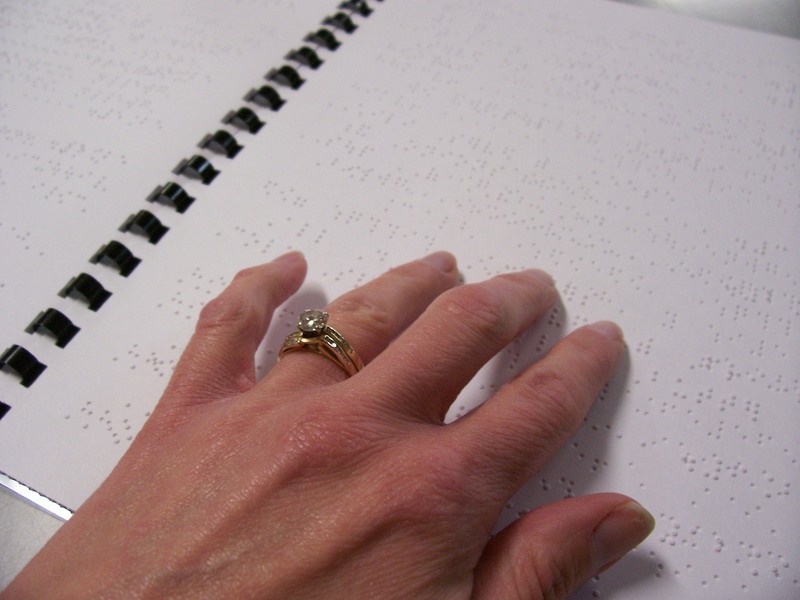 Our Braille Transcription Department can make your documents accessible! Our motto is: “If it can be printed, it can be made accessible.” All of our primary processors are blind, so they know what your customers need. We have decades of experience and set high quality standards, not only for the specific output, but also for overall design and utility. Without high quality dual focus formatting standards transcribed materials can lack the desired communicative impact. We like to characterize this as being legally versus practically accessible. What it means is that even if the document is brailled, without proper formatting, being able to find or understand the information it contains is difficult at best and often nearly impossible. What this means for businesses communicating with blind customers is that it could create a poor user experience for the customer and does not give consumers the information they need to make informed decisions. Whether you need one copy or thousands, English or Spanish, have a one-time request or an ongoing project, Horizons can transcribe your documents into braille. In addition we also format charts and describe images so that braille readers receive all the information in your original documents. Transcription is done under the supervision of certified transcribers and is proofread by expert braille readers to meet all of the standards of the Braille Authority of North America (BANA). Our transcription department also produces braille overlays on thin, clear, plastic sheets. These braille labels can stick over the control panels on laundry machines, microwaves, and other appliances. We also create labels for vending machine buttons and item/price lists. Our overlays even allow you to add braille to cards, certificates, and plaques. Overlays include a sheet showing the braille with the print translation so it’s easy to adhere the overlays correctly. Nearly half of our staff is comprised of blind or visually impaired workers. Horizons can offer high quality transcription services because we use certified proofreaders. By using actual braille users we ensure that the document is correct, accessible and most importantly user friendly. The cost for our transcription services is determined by the size of your document, set-up time needed to format the braille and materials used. Documents can be submitted as hard copies or electronic files. We emboss on 8.5 x 11 inch (letter) or 11.5 x 11 inch 100 pound paper. Binding options include stapling, combs or spiral binders. Covers can also be added. We can also produce saddle-stitched documents on 11 x 21.25 inch paper to produce an 11 x 10-5/8 inch booklet. Additionally, we can create documents with braille and ink on the same page. We also include print labels on braille documents so they can be easily identified and organized.